If you've been watching the nationally televised Scripps National Spelling Bee the last few years then you've probably noticed an interesting trend. Though totaling just over two million people in the United States, those of South Asian descent dominate the national spelling bee. So why is it that a group of people that make up an extremely small percentage of the U.S. population have disproportionate numbers represented in this contest? The BBC News attempts to answer this question in a recent article found here. Their reason? Family support and an emphasis on education. "Chicago-based Dr Balu Natarajan, who won the Spelling Bee in 1985 and was a judge at this year's contest, says there is one common thread among nearly all winners regardless of ethnic background - extensive involvement and support from family. "This is not a contest which many kids can win by preparing solely by themselves. I think that many South Asian families are willing and able to provide this level of support," said Dr Natarajan. His parents helped him by finding word lists, looking up definitions and pronunciations and quizzing him on them. They even took days off work in order to help him prepare." Another thing you'll notice when watching the spelling bee is that there is an inordinate number of homeschooled children competing. In addition, camera shots to the crowd reveal both a mom and a dad there cheering their children on. I remember back to my elementary school years and my own participation in spelling bees. I was a good student, but really didn't put much time into preparing for the bee and typically exited fairly early on. But, for some reason, my third grade year I practiced a lot, studied the word lists each day and my dad put in the time to help me. Unbelievably, I won it that year. And in a school that was probably 85% white, the girl that came in second place was...you guessed it, of South Asian descent. Thanks to the BreakPoint blog for the tip on the article. Now if you want some Spelling Bee humor and you're a Napoleon Dynamite fan, then you'll want to check out this video clip below. Click here if the video player doesn't show. I had one of my most enjoyable Father's Days in recent memory as not only was I able to spend the day with my wife and four children, but also was able to spend the day with my parents and in-laws. It was a great day to spend time together as a family and enjoy one another's company. On the way home from church this morning, Lori and I had a discussion about the different themes in messages that are given on Father's Day as opposed to Mother's Day. The message given today at my home church in Michigan, Colonial Woods Missionary Church, was an appropriate and good sermon on Matthew 7:24-27 and building your life on a solid foundation. While the message was a good one and one that I felt personally challenged by, it seems that the type of sermon that dads get on Father's Day is quite different than that which moms get on Mother's Day. If your experience has been like mine, the message on Mother's Day is typically a feel-good encouragement type of thing about how much we love our moms. And rightly so. But the exhortation given to dads is usually of the "step-it-up, you can do better" variety. Sadly, I think this disparity comes from the neglect that many men give to their responsibilities as a father. I have been very fortunate to have been raised by a loving and caring father, as has my wife, but I realize that many boys and young men don't have that same advantage. Too many men have acted as boys when they impregnate a girl or walk away from marriages, but fail to follow through on the responsibilities that comes with that type of responsibility. By acknowledging that I hope to recognize that there are far too many men that bail on the privilege of being a dad. 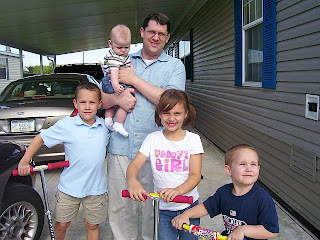 But I also know that many of us aren't going anywhere when it comes to the awesome responsibility of raising our kids. We love our wives. We care for our children. We provide protection and provision for our families. And we do this until death do us part. While many in the mainstream media like to portray as dimwitted, incompetent jerks, most of the men that I know are great husbands and fathers who lead their families courageously in a society full of temptations and competing forces. I would like to give honor to all the dads out there who seek to be godly husbands and fathers and who are committed to staying in the battle for the rest of their lives. I applaud you! I'm pretty bummed about the Pistons failure to defeat the Celtics and advance to the NBA Finals against the Lakers. I was disappointed in their effort in the last part of the fourth quarter in game six and felt that they didn't carry themselves as a championship team should in that type of situation. But I do have to Boston credit and say that they are the better team. They got it done when they needed to and outplayed Detroit in the most crucial points of the season. I just wish Rasheed would have concentrated more on making mid-range jumpers instead of yapping at the officials and dropping f-bombs on national television. They say that laughter is the best medicine, so I couldn't help but share this hilarious piece by Christopher Orr entitled, "A Sports Parable." Very good stuff in the midst of a crazy sports and political season. For the record, I am not a member of either major political party and enjoy good-natured ribbing of Republicans and Democrats alike. Thanks to MGoBlog for the link. Three decades ago a low-budget movie based on the life of Christ was produced by Campus Crusade for Christ and few could have expected that it would go onto to become the most viewed film of all-time. JESUS, a two hour picture based on the gospel of Luke, has been viewed by over six billion people with over 220 million people indicating decisions to place their faith in Christ as a result of viewing the movie. "The filmmakers also appear to have been intentional in reaching out specifically to cultures in which women are abused, oppressed, or made to feel ashamed. An article on InterVarsity's International Student Ministries website notes "internationals from honor/shame cultures may especially be able to relate with [Magdalena's] message." Although Western understandings of the gospel tend to center around guilt and innocence paradigms, many Middle Eastern, Indian and Asian cultures relate more strongly to concepts of honor and shame. For example, in his 1994 EMQ article "The Gospel for Shame Cultures," missionary Bruce Thomas details the breakthrough he had in evangelizing Muslim friends when he moved from legal-model understandings of the gospel to explaining that Christ dealt with the defilement and shame of human flesh by becoming flesh himself." A website has been developed to help in providing resources in conjunction with the release of Magdalena. Hopefully this movie will be widely used in helping to share the Christian message with women that are often neglected in missionary efforts.